I am always looking for new and interesting easy appetizers to start my parties off with a bang. 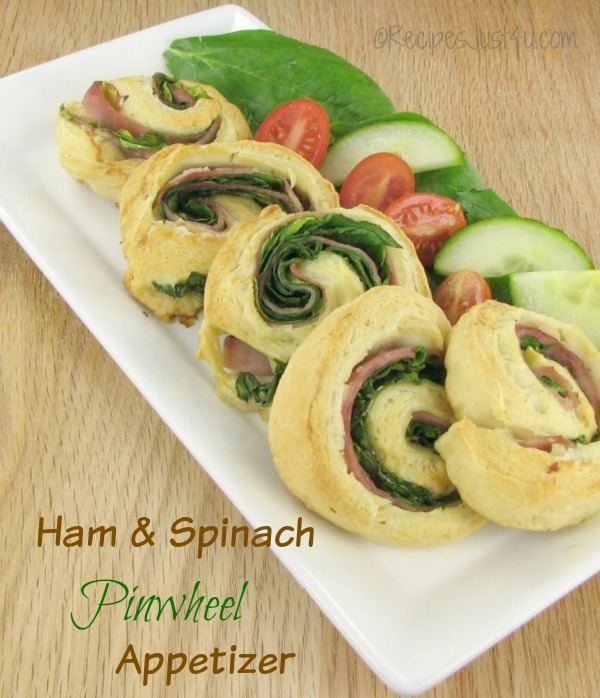 This Ham and Spinach Pinwheel appetizer recipe is super easy to do, cooks in a flash and is also easy to eat and serve. If you are looking for 30 minute meals or appetizers, this one fits the bill nicely! Making the pinwheels is easy as can be. 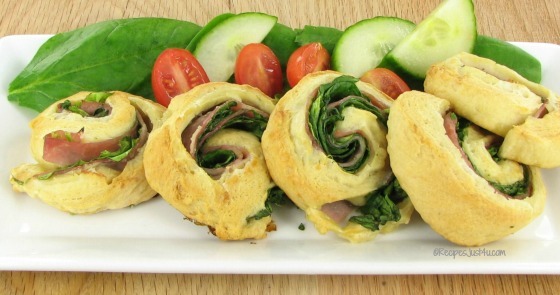 You just use crescent roll dough that you make into four triangles and layer with your ingredients. 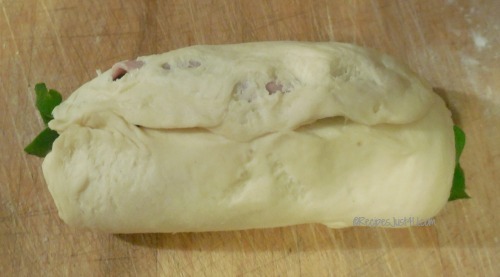 Roll the dough and layers into sausage shaped bundles. Pinch the dough so that it holds. 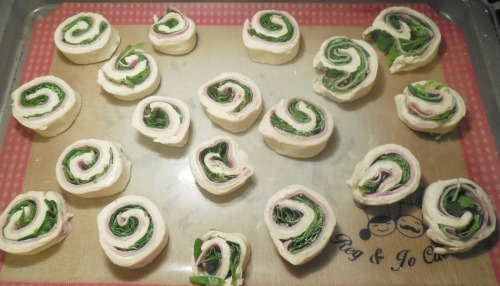 The slice into 3/4 inch pinwheels and bake. What could be easier? About 15-18 minutes in the oven until golden brown and serve. This makes the perfect appetizer but also is wonderful for a lunch with a salad or even dinner with some roasted or steamed veggies. The kids love these too! Stand back and watch the platter get emptied in no time flat. 4 small packs of Laughing cow French onion cheese (or any flavor of the cheese that you like will do. Heat oven to 350. Separate dough into 4 rectangles; press perforation to seal. 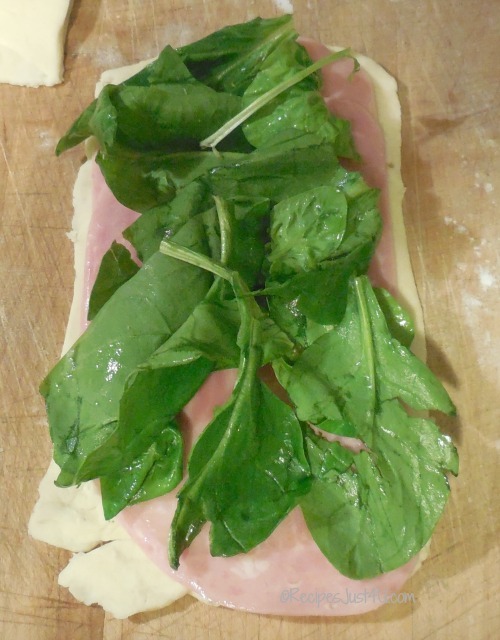 Spread rectangles with cheese to within 1/4 inch of edges; top with ham and spinach. Starting at shortest side, roll up each rectangle; press edges to seal. Cut each roll into 6 slices. Place, cut sides down, on ungreased cookie sheet. Bake 12 to 18 minutes or until golden brown. Start by heating the oven to 350. Separate the crescent roll dough into 4 rectangles and press the perforations to seal. Spread the rectangles with the Laughing cow cheese to within 1/4 inch of the edges. Layer with the ham and then the spinach. Starting at one side of your rectangle, roll up each piece of dough. Press the edges to seal. Cut each roll into 6 slices, trimming the edge pieces so they will sit flat on the cookie sheet. Place the cut triangles on ungreased cookie sheet. Bake for 15to 18 minutes or until golden brown.